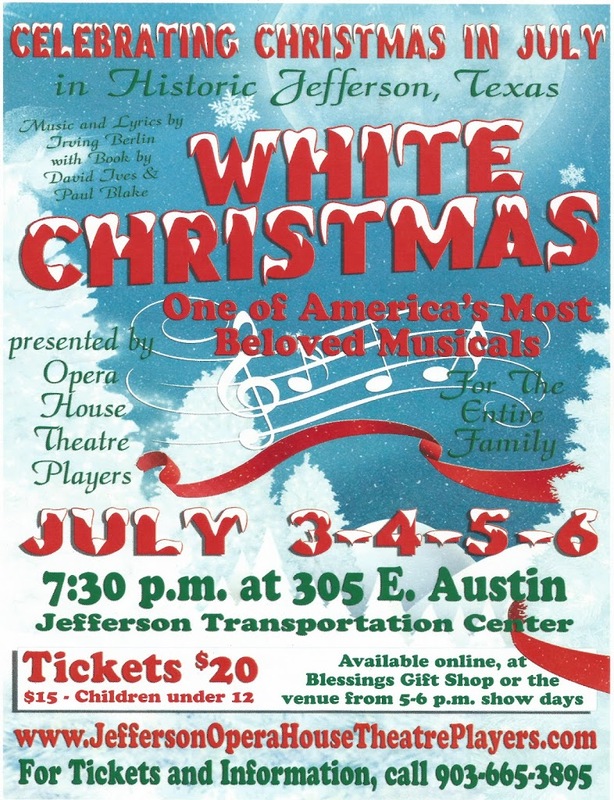 The Jefferson Opera House Theater Players present “White Christmas”. July 3rd thru July 6th, 2013. While it’s hot outside you might want to escape into an air-conditioned building for just a bit and have a few laughs with friends. 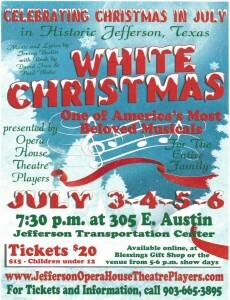 Performances are scheduled to be held in the Jefferson Transportation and Tourism Building at 305 E. Austin St. This is the biggest production the Theater group has undertaken to date, we have every confidence it will knock your socks off. Performances are at 7:30 each evening; Adult tickets are $20-Children tickets are $15. You may pre-purchase the tickets at Blessings Gift Shop- 119 N. Polk St.-Jefferson, Texas; Call (903) 665-3895 or (903) 665-2310. Or you can purchase them online at their website here. This entry was posted in Holidays, Theater by Tammy D. Bookmark the permalink.